Planning your wedding is the most exciting and romantic time of your life. Every wedding is special because every bride is different, and its the planning that will make your day unique. After you’ve arranged the venue, the photographer, the honeymoon, and of course the dress, the next thing on your ‘to-do’ list is the wedding entertainment. There are hundreds, if not thousands, of options available to you – a band, a string quartet, a chocolate fountain, a disco…the possibilities are endless, and prices can vary widely. Most of the choices available to you only keep your guests entertained later on at the evening reception, but what about the lull in-between? Having too much time between the ceremony and the reception is often a complaint at weddings, with guests becoming restless and at worst, bored. If you are having your ceremony early in the day, with a meal and speeches, but not having your reception until the evening, now would be a great time to think of some unique and memorable entertainment ideas to fill the lull. I usually only have time to work at two party’s in any one day. 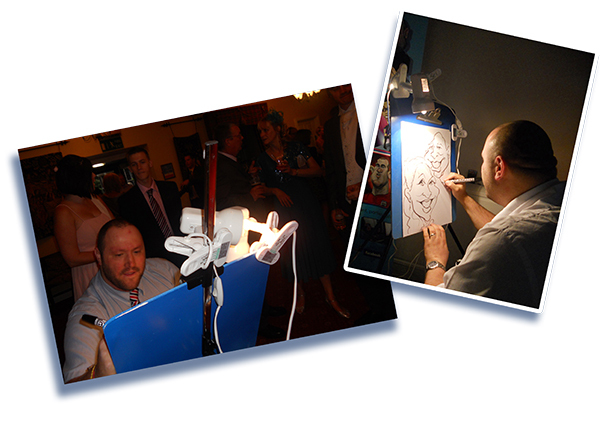 I get booked up pretty early so fill out the enquiry form to secure your wedding caricature entertainment. 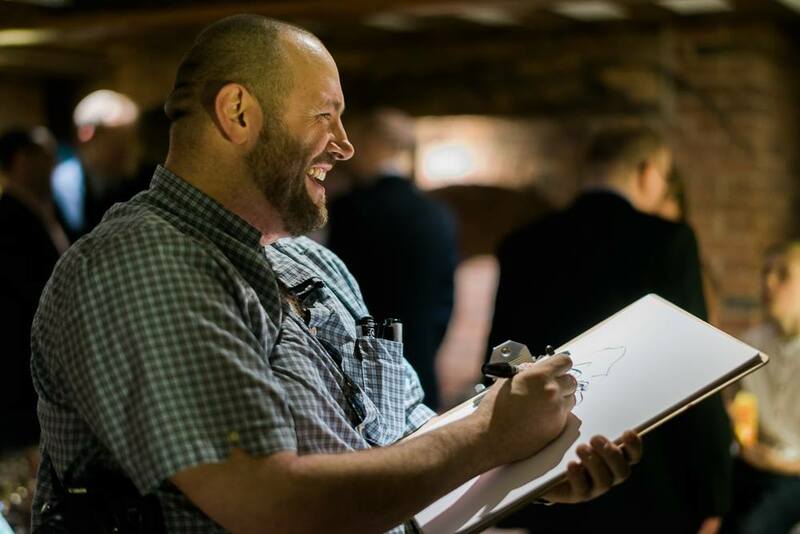 I can work around the room, drawing from table to table, or be seated in the corner of the main room for the guests to be drawn. I come equipped with an easel, paper, and lights, and draw black and white cartoon portraits of your guests. I can draw anything from 12 – 15 people per hour. Wedding caricatures by Beefy’s Caricatures adds a unique touch to your celebration! 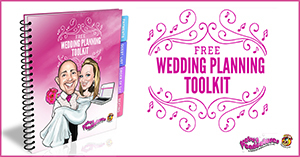 What other wedding entertainment gives your guests a gift to take home with them? When it comes to spending money, your wedding day ranks among the most expensive. 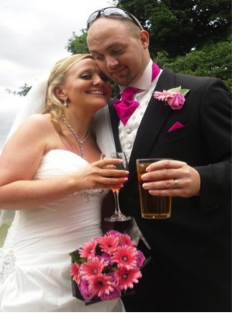 With UK weddings costing an average £18,500, and in some areas £25,000+ (ouch!) you really want to make sure your day is one to remember! Whether you have lots to spend, or are working to a tighter budget, it’s important to remember that it isn’t how much you spend that counts, but how effective you spend the money you do have. There are lots to consider – the dress, the venue, the flowers and the photographer for starters. Some of the costs can be minimized with a little creative thinking. Place holders and wedding favours can be created with a little help from your friends – you could even get the bridesmaids together and throw a pre-wedding ‘make-a-table-decoration’ party. It is important that you celebrate you marriage in style. The entertainment you choose for your reception offers you a chance to really make your mark and put even more of your personality into your day. 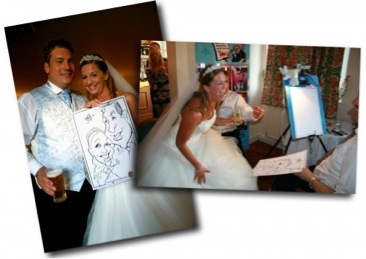 Wedding Caricatures by Beefy offers you a fun alternative to the usual run of the mill entertainment that will really leave an impression with your guests – especially as they get to take home their very own unique gift from the both of you, what other entertainment option gives you that? 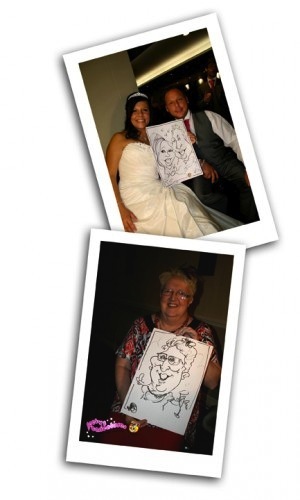 Each caricature takes only 3 -5 minutes and will be in black and white and A3 in size – you can even have a message pre-printed on the sheets – ‘Mr and Mrs Smith would like to thank you for helping to make our day so special’ for instance. 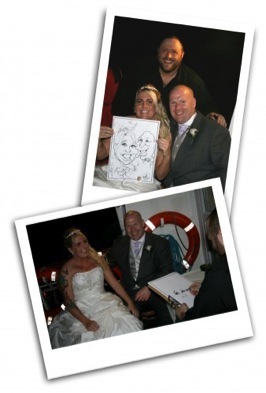 Get in touch to see how Beefy’s Caricatures can help you have a truly memorable wedding day that both you and your guests will cherish forever. Beefy has also had his illustrations appear in international publications and books including Illustration Now! 3, Channel 5 TV, FHM Magazine, Nuts Magazine, Cosmopolitan Magazine, The Observer Newspaper, The Sunday Sun and he has worked with a wide range of corporate clients including RBS, Sainsbury’s, Tesco, Virgin and Firetrap so you know you are in safe hands.